Building work can be an exciting time but also quite a scary and stressful time for home owners. One of the main benefits of employing a Building Company to manage the complete build is to take away from the customer the stress of organising and arranging all of the different trades. This approach may cost you slightly more but the gains far out weigh the negatives. The project is managed, organised and arranged according to the schedule by us. Any delays due to weather or specialist items not delivered on time are our concern and worry and not yours. Any external personnel will also be coordinated – even organised - as required. For example, Building Control, utility companies. 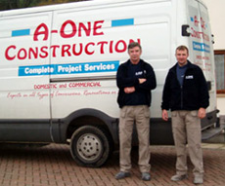 A One Construction has a wealth of experience in the construction and joinery fields. For years we have managed private and commercial work – both large and small. We ensure that all of our employees are competent in the building trade. Any specialist sub-contractors required are personally vetted beforehand to ensure their work meets our exacting standards. From start to finish we will ensure the whole process of turning your dreams into reality is as pain free as possible. We are there as a constant source of advice, reassurance – even inspiration – for those finishing touches. Several of our past schemes have been awarded at the regional Councils annual Build-In Quality Awards. These are nominated by the Building Control Officers employed by the various Councils to showcase examples of projects that they feel used the highest quality materials and workmanship. 2012 saw the upgrade of our business premises to a larger unit in Brynmenyn. This has allowed us to expand the joinery side substantially. Any joinery requirements are now completed in house by our skilled joiners. We also have available for customers a library full of various books and literature on fixtures and fittings. These can be an excellent source of information and inspiration when trying to make final decisions on any scheme. Each project is different – each persons needs are different. But every project, large or small, will have as much input and guidance as you, the customer, personally requires.